Reuters wants you to assume the stock market correction on Wall Street has entered into a full-blown bear market. Their equity analyst then asks: What kind of bear market can we expect? As shown below, all bear markets are not equal, they come in different shapes and sizes, but are less frequent than bull markets and, on average, much shorter. They can be very damaging if counter-cyclical buffers via the government or central banks are not properly deployed. 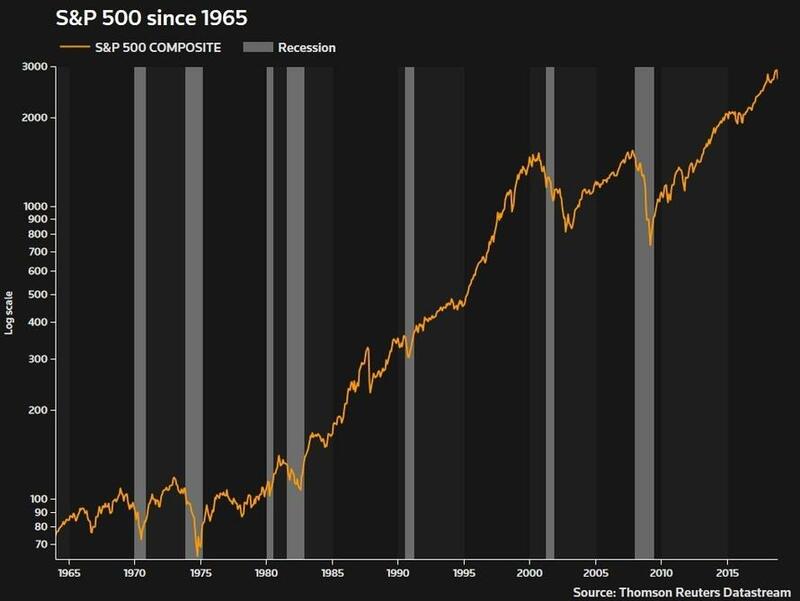 "The stock market is not the economy and the economy is not the stock market, but every U.S. recession over the last half century has been accompanied by major lurches lower on Wall Street.Will history repeat itself next year or 2020?," asks Reuters. Dana Anspach, an independent financial advisor, said since the early 1900s, the S&P has undergone 32 bear markets, which basic arithmetic would tell us that they occur once every three and a half years. Strategists at First Trust Portfolio estimate since 1926 the average bear market lasted 1.4 years, with an average market loss of 41%. The most recent bear markets on Wall Street in 2000-02 and 2007-09 saw the S&P collapse by over 45% and 50%, respectively. 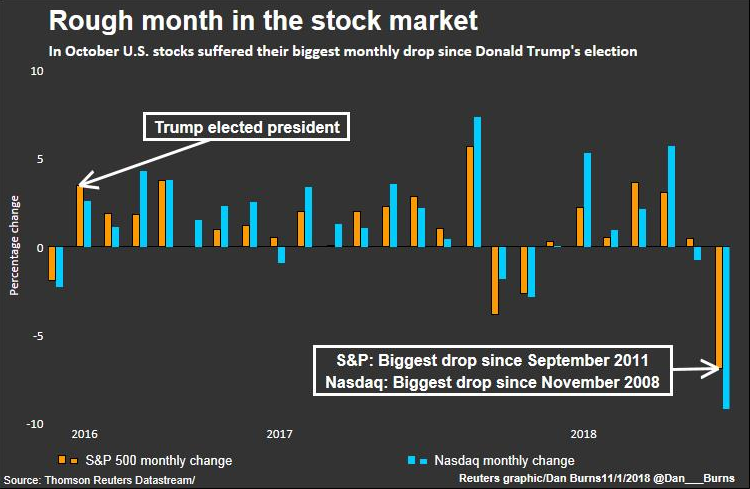 "The correction underway on Wall Street has seen the S&P 500 fall 11.5% from its peak a month ago, while the MSCI World has fallen as much as 15% from its peak in January, also in part driven by major weakness in emerging markets. China, for example, is down 30% from its January peak. But as long as the U.S. selloff is just a correction, the multi-year bull run remains the second-longest in history, even if it is losing steam. There are compelling reasons to believe it will roll over into a bear market, but getting the timing right is tricky. Bull markets run much longer than bear markets as populations and economies expand. More people means more savings that need to be invested, and as equity historically has offered higher returns than bonds, stock markets attract more of those funds and rise over time," said Reuters. Bespoke Investments said the average bull market since 1927 is approximately 1,000 days. The most extended one in history was 1987 to early 2000 run of 4,494 days. Already, the current cycle is at 3,000 days, would break the record if run extends until June 2021. The chart below from FT Portfolios shows that the average bull market since 1927 lasted 9.1 years, with an average cumulative total return of 480%. Reuters warns the current bull market is already 9.7 years long. Anspach also said 53% of all S&P trading sessions have been “up” days and 47% have been “down” days. Regarding months, the split is 58% up and 42% down, and in quarters it is 63% up and 37% down. October was a rough month for the stock market. The S&P dropped 6.9% last month, its worst month since 2011. The Nasdaq had its most significant drop since the 2008 crash. As the US expansion is becoming increasingly mature, investors’ concerns over declining global growth, escalating trade war, monetary tightening, and emerging market woes could be the tipping point that triggers the next rolling bear market in stocks. The US expansion seems fine for now, but the next recession could loom sometime in late 2019/20. 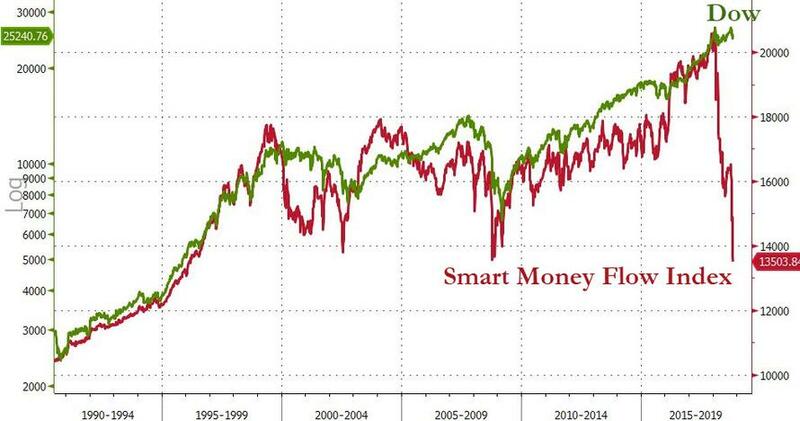 One narrative, that is growing louder, behind the October market panic is that smart money is derisking ahead of the next downturn.